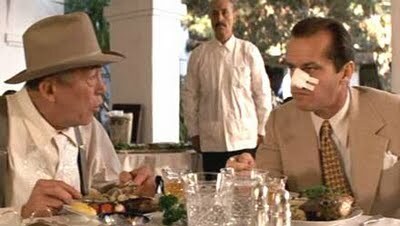 Jake Gittes: Let me explain something to you, Walsh. This business requires a certain amount of finesse. From the dark lighting to the clothing, Chinatown (1974), directed by the enigmatic Roman Polanski, is an ode back to an earlier kind of film: those film noir pieces of 30 or 40 years earlier. The mood for the film is set early on as the credits scroll down the screen in that subtle sepia tone to the tune of that mood-setting “late night bar” jazz. The score was done by Jerry Goldsmith who, in addition to having an excellent taste in first names, seamlessly weaves the events of the film together. Jerry (I think we can be on a first name basis) utilizes chilling piano and harp to build suspense. It’s one of the greatest things about this movie: it’s ability to effectively build suspense numerous times in a sort of intricately designed roller coaster. The film features a young (long before sunglasses at the Lakers’ games) Jack Nicholson, who is a perfect fit for the hard-hitting, rule-breaking private detective Jake Gittes. 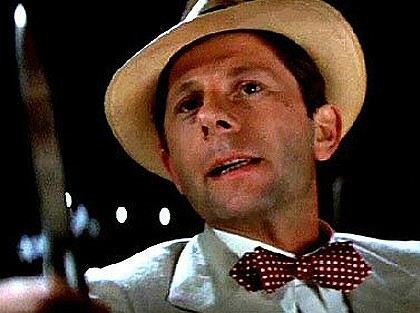 Gittes is cocky, and his arrogance gets him into trouble more than a handful of times. On one specific occasion, Gittes almost loses his nose by way of a knife wielding guard (Roman Polanski’s cameo) after he hops the fence into a no trespassing area. Chinatown is a fast film to say the least. By that I mean things happen so fast that you really have to pay attention. The confusion doesn’t take long to begin either. In the beginning, Gittes is hired by a woman (who claims to be a Mrs. Mulwray) to see if her husband is cheating on her. Once Gittes has found evidence, it gets published in the newspaper, and it seems as though his job is done. This idea quickly dissolves when another woman (Faye Dunaway) shows up to his office with her lawyer claiming to be the real Mrs. Mulwray. And so begins the convoluted storyline which constantly makes you go from being sure you know what’s going on, to being clueless with relative frequency. Underneath all the important events of the film, there is a repeated reference to “Chinatown” (possibly an inspiration for the title?). We find out that Gittes used to work in Chinatown and perhaps we can deduce that the location serves as a symbol representative of the fast-thinking and dangerous situations he encounters in the film (as he would have faced in Chinatown). Eventually, the seemingly routine domestic case that Gittes originally attempts to solve turns into a curious scandal involving the water department. More specifically, LA is in the midst of a drought, yet the water department seems to be secretly siphoning off water (scandalous, huh? Don’t be fooled by the simplicity of it, or my unnecessary sarcastic tone) Gittes knows that there is much more to the case than what he is being told, so he decides to do a little investigating on his own (much to the dismay of the water department, the police, and even Mrs. Mulwray). It’s funny, just about every place Gittes goes snooping, he ends up being beaten to a pulp. Chinatown takes plot twits and makes them twisted. You really have to hang on to every little detail of what everyone does and says to keep up with what is going on. Nothing is insignificant. Chinatown, as with most movies it seems, slowly reveals a love triangle (one you wont see coming). It’s one of those moments where you go, “WHAT? 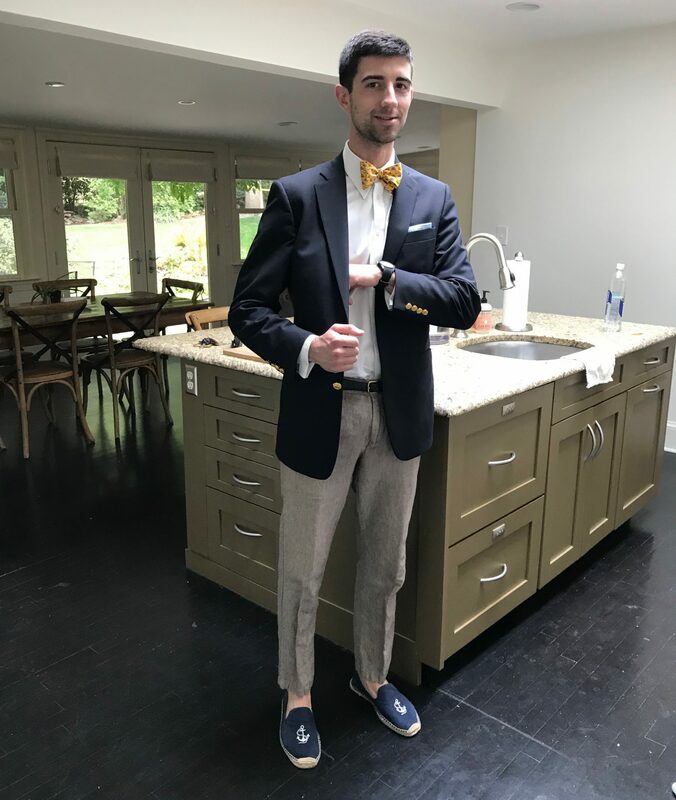 !” And of course, Gittes sleeps with Mrs. Mulwray, although it is left to one’s own devices as to whether he did it primarily to get information out of her or not. Mrs. Mulwray always speaks with a certain unstable tone. She gives the impression that every sentence coming out of her mouth has been processed to conceal the truth, and that she is most definitely hiding something (or perhaps everything). The brilliance of Chinatown is that you may think it’s going to be like every detective movie you’ve watched before, but it turns out to be something completely different. In many ways, the film doesn’t make sense. When the movie ends, it leaves you wondering if you actually figured out what happened or if you need to watch it again. Even after I watched it again, I still wasn’t really sure, which begs the question, “Is it supposed to make sense?” I do believe that after watching it a third time, and thinking about it, the answer is yes… or rather, it depends. I believe it is up to you to decide. Either way, whether you hung on to every detail and it all clicked for you, or you have no idea what happened, it is a movie you can appreciate. 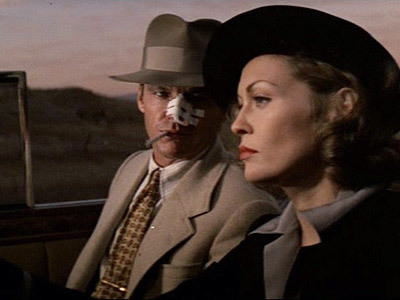 Chinatown is one of my favorite detective films, if that’s what you want to call it.